Would have been a good few places higher until the last batch of DLC arrived. This ostensibly simple track not only pays respectful homage to the titular NES classic, but its randomly-generated ramps ensure it plays out differently each time. You’ll need to weave down the straights to succeed: stay in the same lane and you leave yourself worryingly open to shells, fireballs and boomerangs. While your top speed is dependent on your kart selection, there’s no denying some Mario Kart tracks feel significantly quicker than others. Piranha Plant Pipeway goes by in a blur, from that initial descent to the moment you break the surface of the water and soar through (or, in 200cc, above) the castle ramparts. As with Big Blue, this doesn’t quite hit the spot until at least 150cc – it’s telling that the track has so many boost chevrons to pick up the pace. Nonetheless, this captures the essence of F-Zero – fast, winding, narrow tracks where a single nudge or shunt is enough to bounce you into the void. At least here you’ve got someone to fish you out. Bonus marks, too, for the tremendous orchestral remix of the track’s theme. For all the gravity-defying gimmickry of the new tracks, I’m not sure any other track captures that rollercoaster sensation quite as well as the stomach-lurching dip near the start here. Substantially prettified from the last-gen original, it’s a shame we lose the half-pipes, but getting boosted instead of halted by bumping into the mine carts compensates somewhat. And the alternate route near the end is still great. 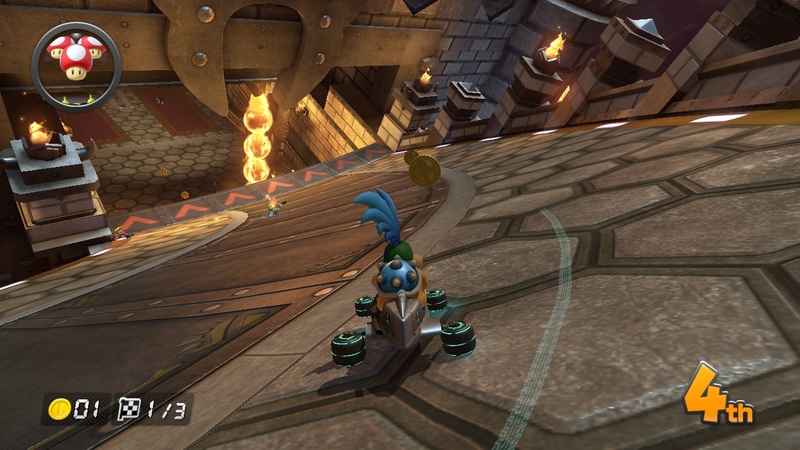 An oldie but a goodie, this outwardly simple track requires some careful cornering, and has one of my favourite little visual touches in the entire game – that slick sheen on the damp patches that lead back around to the start. It’s a refreshingly short burst of classic MK action, with one of the best mushroom shortcuts ever. A beamingly cheerful funfair ride, this is far better than a first cup’s second track has any right to be. It’s a concentrated blast of unpretentiously straightforward fun, and tends to keep the pack nicely bunched together, arguably more so than most tracks. Certainly, it’s been responsible for some of my closest multiplayer finishes ever. Few people would put it in their top five, but it’s a course where you consistently end up having more fun than you expect. Nestled between two of the most disappointing tracks in the game, Bowser’s Castle naturally looks good by comparison. Yet it’s a fine course in its own right, its sharp corners in the early part redolent of earlier versions before it shifts into something different entirely. Lava, lasers and a giant Bowser statue that either squashes you flat or creates ripples to trick off: what’s not to like? This is probably too low a position for a terrific and unusual course with a wonderfully percussive soundtrack, though the idea of these seething stones crashing down onto the track is hardly a new one. The rolling cogs represent a new kind of hazard, mind, and it’s always fun to play a track where laps two and three look a little different from the first. 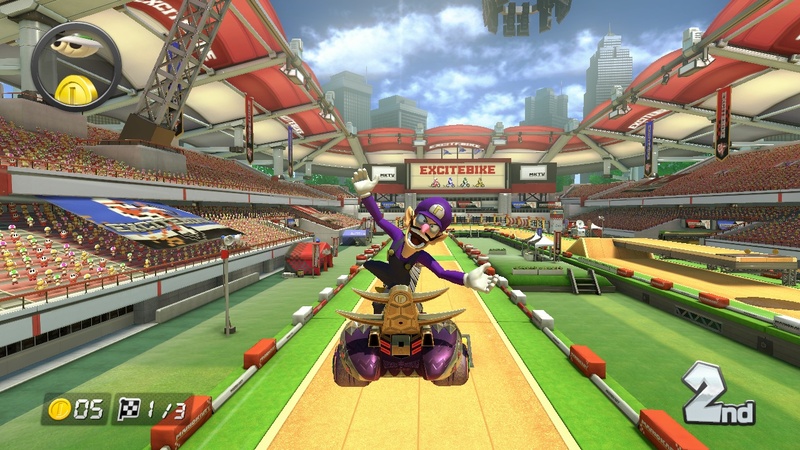 Widely disliked – perhaps because there’s general ill-will among the Mario Kart community towards underwater sections – but I don’t care. This lifts my spirits every time I play it: tracing the leaps of the dolphins through the golden rings is a lovely flourish, the undulating eel adds a note of unpredictability to the mid-section, and the moment when you emerge, arcing around that rocky spar as the saxophone kicks in is just glorious. 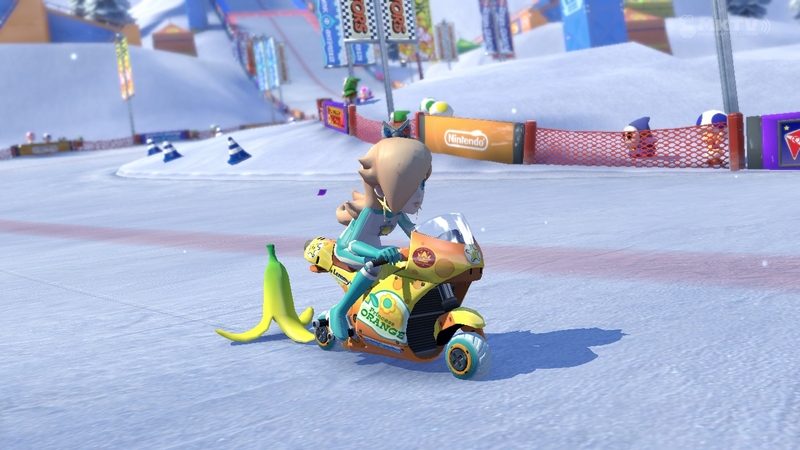 Oh, and in 200cc, clever racers can glide all the way over that fiendish final turn. It’s maybe a track of great individual moments rather than a consistently strong design, but I love it. In which the Shy Guys become surrogate Ewoks living inside a giant tree, making weirdly cute chanting sounds as you pass. The water slide section that segues into a hop and a skip across those giant floating leaves is great fun, and the only real complaint I have is that you never quite get a sense of where you are in spatial terms – it’s only on viewing the replay that you realise you start by haring up a vertical straight. It can’t be easy to capture the spirit of a game in an entirely different genre. F-Zero is one thing, but Zelda? Yet it works, brilliantly, from rattling over Hylian cobbles to the mystery jingle playing as you hit an item box and the wonderful moment you trigger the shortcut in the castle to jump past (and boost off) the Master Sword. Coins become rupees; Piranha Plants are recast as Deku Babas, and that theme tune is as stirring as ever. It can’t be easy to capture the spirit of a game in an entirely different genre. F-Zero is one thing, but Animal Crossing? You get the picture. The four seasonal variants don’t radically change the track or anything, but each is a treat for the eyes – though the course design is fairly straightforward, it would be wrong to dismiss the sheer aesthetic pleasure of the thing. Gorgeous. Another tricksy one with diverging routes, though Electrodrome gets away with it – not just because you’re zipping around winding fretboards, but because they’re both wide enough to accommodate multiple karts but narrow enough to keep things tight and tense. And the unique visual signature and pulsing disco theme make for a delightfully distinctive track: no other course looks or sounds like this. Imagine a Zelda game where Lon Lon Ranch looked like this. Proof that simple courses can still be thoroughly entertaining, Moo Moo Meadows is the sort of track you’re always pleased to see among the four available for selection: nothing too taxing, just a fun and consistently competitive course that happens to be set in a pastoral idyll, tinged with a pink-orange glow from the low-hanging late afternoon sun. 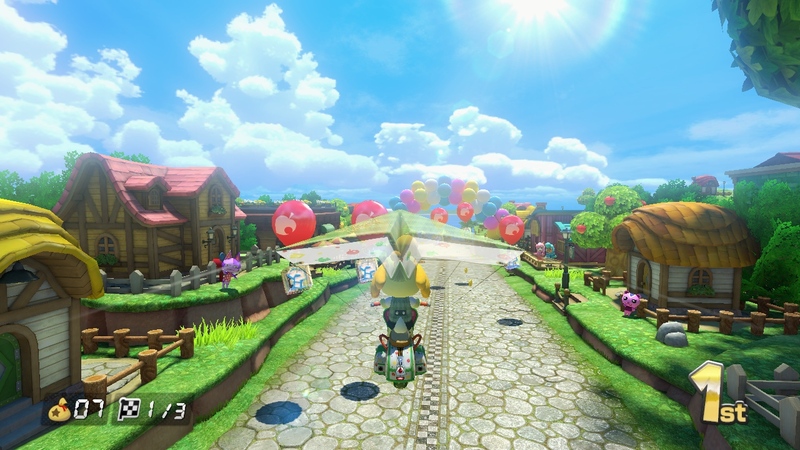 It passes by with a happy, wistful sigh: you’ll wish you could climb out of your kart, lie down on the grass and simply gaze up at the fluffy clouds as they glide lazily by. Talking of simple courses, here’s a simple Moebius strip elevated to greatness by subtle refinements, fine details and deceptive hazards: those Goombas and Piranha Plants should be so easy to avoid, and yet… Mario Circuit is one of the few tracks to make you properly aware of the fact that you’re racing upside-down, it’s blindingly good in 200cc, and the CLANG as you glide into the sign at the end of each lap is the game’s most satisfying sound effect. A real grower. When I started compiling this list, this was hovering around the 20 mark, but it just kept climbing. It’s a combination, I think, of a really well-designed track and a frankly unnecessary attention to trackside detail that most players will never see (the graffiti mural is a sublime touch). It’s a course packed with miniature delights: the World 1-1 riff working its way into the music; that tricky kink before the final turn which has you turning left and immediately left again; the barriers that open just as you think you’re about to smash through them. Next week it might just be top five material. The look of this completely slays me. We’ve seen the Toy Story thing done numerous times before, but never has it been realised so expertly. If Pixar made racing games, etc. Beyond that, it’s a course that looks much more straightforward than it is: the ribbon’s undulations are tempting to trick off, but given the absence of barriers you could easily end up skidding off the sides. So beautiful it even gets away with a none-too-subtle advert for Yoshi’s Woolly World. Gusty Garden Galaxy x Mario Kart. Enough said. 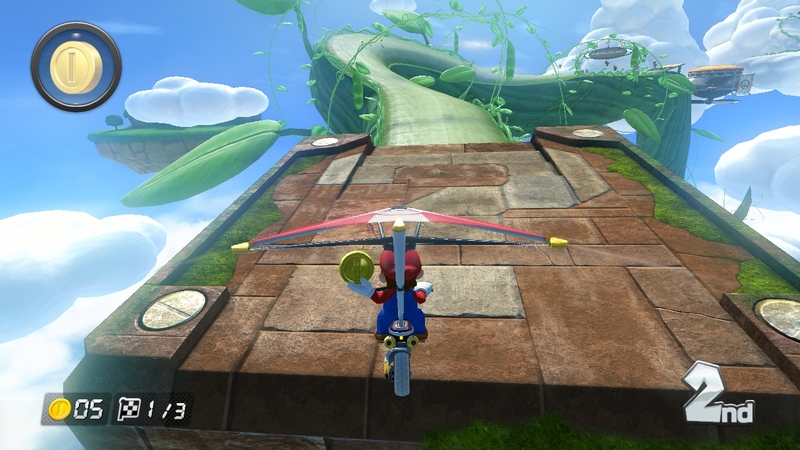 So quickly do you acclimatise to anti-gravity that it’s easy to take a track like Shy Guy Falls for granted. Not so much on your first couple of goes, admittedly, where you think the novelty of racing up a waterfall might never wear off. It’s never quite as much of an eye-opener thereafter – or so I thought. Up, round and back down in 200cc is an exhilarating rush – or a cascade of excitement, if you will. Setting aside for a moment my annoyance at the inexplicable abbreviation of GameCube to GCN, Yoshi Circuit can consider itself unfortunate not to be even higher. No one at Nintendo could possibly have conceived Mario’s dino/dragon pal with a view to one day turning his outline into a race track, but it fits so perfectly you begin to wonder. It’s a very technical track, which means it’s unpopular in some quarters – and admittedly it’s best played with people accustomed to its nuances. But you’ll struggle to find a better time trial course in Mario Kart’s entire history than this. Superb. No, you shut up. Listen: this isn’t simply fond memories of Double Dash!! talking. You will never convince me that Baby Park is anything less than excellent, and here’s why. It’s perhaps the purest expression of the series’ shift towards weaponised racing, a manic game of dodgems where fortune favours the fortunate, and chaos reigns. It’s not, as some would tell you, NASCAR for toddlers – not least because staying ahead of the pack involves some sharp cornering and intelligent use of defensive items. Of course, more often than not it descends into outright madness, a demolition derby where you spend half your time at full pelt and half the time getting hit. But give me a track that makes you rage as much as laugh over a bland, forgettable procession. Baby Park offers the rare sensation of peril when you’re way out in front, and an opportunity for back markers to remain involved throughout, even if it’s simply taking out your frustrations on the leader with a cathartic red shell. It’s the only track where there’s a good chance you’ll either lap or be lapped, or both. It stands apart, proud of its capacity to captivate and irritate all at once. A classic. Try not to smile. It’s impossible. A summer holiday in race form, it mirrors the airport experience perfectly. The countdown is the wait for your flight to be called; there’s the excitement as you approach your gate; and whether you’re racing through the fuselage or around the wheels of the grounded plane, you’ll recall the fiddly process of queuing to board and finding your seat. Finally, you’re off! Racing down the runway before lifting your front wheels off the tarmac until you’re up, up and away. Then, as you circle around and begin your descent, you witness another group of holidaymakers taking off, as you pass beneath the undercarriage of a Jumbo jet mid-flight. And all the while, you’re accompanied by an uplifting earworm of a tune – so breezy and happy it might as well be called “we’re going abroad for a week, isn’t life amazing?” 45 seconds of undiluted joy, times three, and a squeak shy of top spot. A predictable pick, sure, but how could this not be number one? You immediately know you’re in for a treat from the brassy sting as you set off, a fanfare that could only possibly herald something amazing. What follows is by turns breathless and breathtaking, and strangely akin to a multi-event winter sports discipline. The icy start is basically speed skating, luge and bobsleigh rolled into one, then later you’re weaving in and out of trees like a skilled snowboarder, before donning invisible skis for a thrilling slalom and finally accelerating downhill for take-off like a practised ski jumper. What else? The skid past the line as you turn around to greet the runners-up losers behind you; that tiny ramp around the icy bend into the water section that cuts the corner if you can land it; the hidden shortcut through the snow that marks a middle route between the left and right forks. If it comes up a little too often when you’re playing online, that’s only because it’s too good to turn down. And why choose anything else when one of the options is quite possibly the best Mario Kart course ever?